I used this code in a WordPress site but it’s pure HTML. 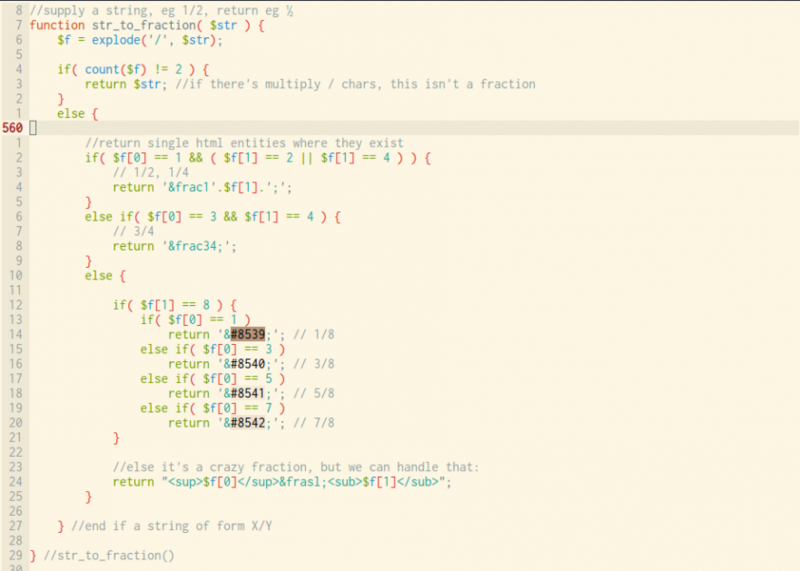 I wanted to take a string, for example “3/4” and convert it to a HTML entity ¾. When there’s no HTML entity I still wanted it to look nice, using <sup> and <sub> for the numerator and denominator respectively. It’s pretty straight forward. First we check that the string is of the form X/Y. We put the X and Y into an array, and then use those elements to find a nice HTML entity that matches. If we can’t, we use <sup> and <sub> elements, for example 4⁄27. I hope this saves you a little time – when you’re working on deadline, every minute counts!